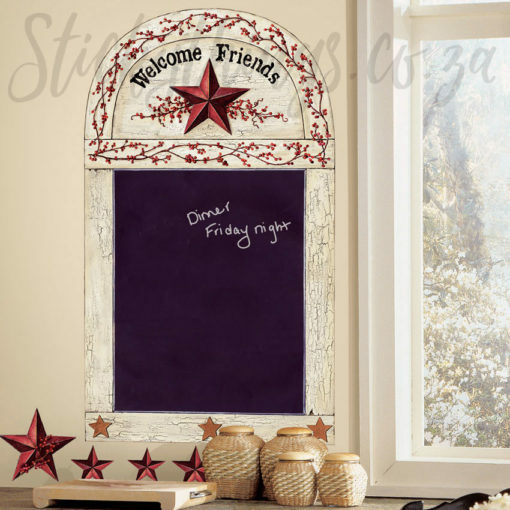 This Welcome Chalkboard Wall Decal is a Giant Peel & Stick Chalk Board with Stars Wall Sticker. Free courier delivery in South Africa plus free chalk too! This Re-usable Welcome Chalkboard Wall Decal comes standard with a functional black board which is surrounded by a what looks like a real distressed frame! It is actually printed to look like a shabby chic wooden frame and it also features an almost painted Stars and Berries within the frame, it looks very realistic. If positioned like our main photo, these Welcome Chalkboard Wall Decal measure 1m x 64cm (h). – Type of Wall Decal: Peel & Stick Chalkboard Decal. – Material: Printed onto Chalkboard Wall Sticker Material. – Wash-ability: Washable (wipe clean like you would a black board). – Other: Suitable for any wall colour, Made in the USA. – Welcome Chalk Board Wall Decal (with frame decal) – size: 43cm x 72cm. – 14 Red almost 3D handpainted Red Stars (smallest 5cm and largest is 14.5cm, see sheet photo). – FREE: Chalk (so you can start writing straight away!!). This Family and Friends Welcome Chalkboard Wall Sticker is a fully functional Shabby Chic message board to any room of your house! We really love using this chalkboard for Christmas time as it is quite festive with he 14 extra red stars, you can then pack it away for next year – or use it all through the year! We also love writing shopping lists or family motivational messages on this board. Like all RoomMates Decor products, these functional wall stickers are removable and repositionable making it easy to move from room to room -or if you move home. Pair this chalk board decal with any of our other Country Decal Designs to create a full theme in any room. Plus, get a free piece of chalk so you can start writing straight away! Average Installation Time: 30 minutes (we also recommend laying it flat for at least a day before using them).